Why Do Athletes Use Drugs? How Many Athletes Use Drugs? Athletes may abuse drugs to enhance or improve athletic performance, cope with stress, or deal with other career challenges. Drug abuse among athletes is common and can have serious long-term effects, such as arrests, bans from a sport, or overdose. Improve athletic performance. Athletes may turn to drugs such as steroids to gain an edge on the competition. This is known as doping and is widespread across different sports, ages, and levels of competition. Cope with mental illness. Athletes often receive treatment for physical injuries. But they are less likely to receive mental health treatment. Some athletes may use drugs and alcohol to treat their symptoms. Deal with pressure. Athletes often face a significant amount of pressure on and off the field. They may face pressure to win, improve their performance, or quickly recover from an injury. To cope with this pressure, some athletes may take drugs. Treat physical injuries. Athletes who suffer physical injuries may use drugs, such as opioids and marijuana, to deal with pain.3 For some athletes, addiction starts when they are prescribed painkillers for an injury. Over time, they may begin to misuse their prescriptions—eventually becoming both physically and psychologically dependent on these medications. Cope with retirement. Athletes may be faced with retirement much earlier than other careers. Leaving the game can be a difficult transition for athletes who are not prepared to retire and miss the thrill of competition. Drugs and alcohol may be a way of managing this stress. Deal with peer pressure. Drug abuse is common in athletics, with an estimated 67% of bodybuilders using steroids, 52% of professional football players using opioids, and up to 93% of college athletes using alcohol. Some athletes use drugs or alcohol merely to fit in. Athletes may use a variety of drugs, such as performance-enhancing drugs, stimulants, and opioids, to improve their performance, manage pain or injury, and deal with the stress of athletics. Anabolic steroids. The human body naturally produces anabolic steroids in the form of testosterone, which aids muscle-building.4 Athletes may use high doses of anabolic steroids to increase muscle size, work out harder, and recover more quickly from workouts. Diuretics. Athletes may use diuretics to lose weight or to pass a drug test.2,4 Diuretics work by altering the body’s fluid and electrolyte levels.4 They are popular among sports that support strict weight control, such as boxing and wrestling. quickly develop significant physiological dependence and, ultimately, addiction. Adderall. Adderall is a prescription stimulant used to treat attention-deficit hyperactivity disorder. Research suggests it may improve alertness, focus, and reaction time.2 Like other stimulants, athletes may use Adderall to enhance performance, control fatigue, and lose weight. Alcohol. A significant number of athletes drink alcohol.2 Perhaps surprisingly, some athletes drink alcohol prior to a game or competition to reduce anxiety and thereby enhance performance. There is little evidence that this works, however. Consistent alcohol use is more likely to lead to other issues that actually hinder performance. Additionally, some sports teams may encourage binge drinking as a form of initiation for new members. Anabolic steroids. Between 0.7% and 6.6% of high school athletes and between 0.2% and 5% of male college athletes have used steroids in the past year. Around 9% of professional football players and 67% of competitive body builders have used steroids at some point in their careers. Alcohol. Between 71% and 93% of college athletes drank alcohol in the past year. Marijuana. Among college athletes, 28% used cannabis in the past year. Opioids. Between 52% and 71% of professional football players have used opioids at some point in their careers. Stimulants. Around 3% of college athletes report using stimulants. Suspensions and bans. Many professional athletic organizations have strict rules against using performance-enhancing and recreational drugs. Athletes who violate these rules may face serious consequences, such as suspensions or bans. In some cases, prior titles, medals, or prizes may be revoked. Professional athletes such as Lance Armstrong, Steve Howe, and Brett Favre have suffered these consequences. Job loss and early retirement. Drug abuse can impair an athlete’s ability to focus and otherwise negatively affect an athlete’s performance. Certain drugs will give rise to a number of side effects and may be associated with performance-hindering withdrawal symptoms. Some athletes may be forced into early retirement because of the negative effects of their drug use. Opioids such as heroin and prescription painkillers have a high risk of overdose. When these drugs are injected, the user’s risk for contracting infectious diseases increases significantly. Addiction. The abuse of certain drugs, such as opioids and stimulants, can lead to addiction.1,6 Addiction is a brain disease that involves compulsive drug use despite negative consequences.1 Athletes who are addicted to drugs or alcohol may have a difficult time quitting without professional treatment. Death. Amphetamine use may lead to fatal hemorrhagic stroke or heart attack.5 Abusing opioids like heroin or prescription drugs also carries a high risk of lethal overdose. College basketball player Len Bias and professional hockey player Derek Boogaard both died of fatal drug overdoses. Inpatient treatment programs provide intensive group, individual, and family therapy, along with temporary housing. Therapy is focused on helping people understand and recover from their addictions. Outpatient programs offer therapy for several hours per week, with participants returning to their own homes or other residence during non-treatment hours. The intensity of therapy depends on the specific program. Intensive outpatient programs (IOP) typically offer treatment for 2 to 4 days per week, while partial hospitalization programs (PHP) may offer treatment for 5 or more days per week. Twelve-step programs are based on the philosophy of Alcoholics Anonymous. 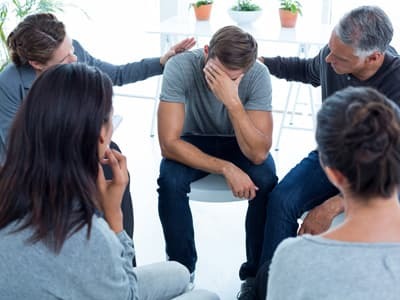 These programs help people break through denial, recognize the seriousness of their addictions, establish a connection with a Higher Power, and develop relationships with other sober people. Cognitive behavioral therapy (CBT) is a therapy for treating addiction that helps people identify and change negative thoughts and behaviors.7 Therapists help participants come to see the relationship between their thoughts, feelings, and behaviors and teach relapse prevention and coping skills. Network therapy can be a helpful intervention for treating cocaine addiction. Network therapy supports family and peer involvement in treatment and incorporates tools and strategies from CBT.8 Athletes may benefit from having their teammates participate in network therapy. Motivational interviewing helps people in early recovery work through their ambivalence about change.7 Athletes may come to treatment with conflicting feelings about their drug use (which is known as the “precontemplation” stage of change).2 The goal is to help people recognize the consequences of their use, develop motivation to quit, and begin taking steps toward change. Athletes with substance abuse issues may also struggle with co-occurring mental illness, such as depression, anxiety, or other mental health issues. Drugs and alcohol may be a way of coping with a pre-existing mental health condition.2 Specialized treatment programs are available to help people struggling with such dual diagnosis issues. These programs offer both addiction- and mental health-targeted therapeutic interventions, including counseling, psychiatric medications, and support groups led by trained professionals. Methadone is a synthetic opioid agonist used to treat opioid addiction. It helps to prevent withdrawal symptoms, decrease cravings, and block the effects of other opioids. Methadone is only available in specially licensed clinics. Buprenorphine is a synthetic partial opioid agonist that is used to treat opioid addiction. The medication helps prevent withdrawal symptoms without producing a pleasurable high. Specially licensed practitioners are able to prescribe buprenorphine for the treatment of opioid dependence. Acamprosate, or Campral, is a medication used to treat alcohol addiction. It can help relieve symptoms of prolonged withdrawal, such as anxiety, depressed mood, and insomnia. Disulfiram, or Antabuse, is a treatment for alcohol addiction that produces an unpleasant response when alcohol is consumed. It can help deter people from drinking, especially in high-risk situations. Naltrexone is an opioid receptor antagonist used in the management of both alcohol dependence and opioid dependence. Naltrexone works by blocking some of the reward associated with use of both substances. Its use requires a significant amount of motivation from the person in recovery, especially if daily dosing is involved. A extended-release intramuscular injection form of naltrexone is available (Vivitrol). Acupuncture is an ancient Chinese practice that involves placing small needles in certain points in the body. Massage can release muscle tightness and tension and is widely used by athletes to help recover from injuries. Yoga combines physical exercise with breathing and meditation. It can help athletes become more aware of their bodies and better cope with their pain. Reardon, C. L., & Creado, S. (2014). Drug abuse in athletes. Substance Abuse and Rehabilitation, 5, 95-105. National Institute on Drug Abuse. (2015). Drugs & health blog: Pro athletes, marijuana, and opioids. Mayo Clinic. (2015). Performance-enhancing drugs: Know the risks. ESPN. (n.d.). Drugs and sports: Amphetamines. British Broadcasting Corporation. (n.d.). Drugs in sports. Zickler, P. (2003). Network therapy expands treatment capabilities of small practice providers. NIDA Notes, 18(2). New York Daily News. (2015). Lamar Odom in a coma, has ’50-50′ shot of surviving 3-day booze and drug binge at Nevada brothel. Peter, J. (2016). John Daly on turning 50: I beat the odds. USA Today. Puma, M. (n.d.). Strawberry’s story one of unfulfilled potential. ESPN. USA Today. (2015). Ex-MLB star Strawberry opens new rehab center for addicts. USADA. (2012). Lance Armstrong receives lifetime ban and disqualification of competitive results for doping violations stemming from his involvement in the United States Postal Service pro-cycling team doping conspiracy. Whitley, D. (n.d.). L.T. was reckless, magnificent. ESPN. Montague, J. (2012). Hero or villain? Ben Johnson and the dirtiest race in history. CNN. ESPN. (2015). Josh Hamilton suffered drug relapse. Diaz, J. (2017). The sad story of Tiger Woods grows even sadder. Golfworld. Pierson, D. (1996). Favre to fight his ban on alcohol. Chicago Tribune. National Institute on Drug Abuse. (2012). Pharmacotherapies.